Raised in Tucson, Lois is a 1951 graduate of Tucson High School. She competed in all three disciplines of the sport of archery: Formal Target, Field Archery and Indoor Archery. 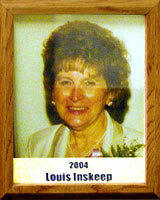 From 1958 to 1978 she competed in approximately 400 archery events at the local, state, regional and national levels. In bare bow, freestyle and bow hunting, she had a winning percentage of greater than 90 percent. Before entering her first national tournament, she had won 16 state titles. In 1974 she won her first national tournament, the National Women’s Limited Archery title at the National Field Archery Championship in Golden, Colo.
A member of the Tucson Broken Arrow Bowmen, who practiced on the range at the end of Trail’s End Road, Lois got into archery at the insistence of her husband Berk (a member of the Professional Archers Association), who also became her coach. It ran in the family with her daughter Debbie becoming a member of the University of Arizona Archery Team in the 1970s. Lois served on the advisory staff of M.B. Bows in Tucson; Groves Archery of Albuquerque and Fred Bear Archery of Grayling, Mich. She primarily helped design archery bows to fit women (recurve and compound). She served on the boards of three local archery clubs and the Arizona Bow Hunters and Field Archery Association for approximately 14 years. Later in her career she and her husband promoted archery as a family sport and gave demonstrations to civic groups as well as being involved with the Tucson Asthmatic Foundation and working with handicapped archers.